The story starts when the Teixcalaanli empire requests a new ambassador from Lsel Station, which is currently an independent state. Mahit Dzmare is tasked with doing what she can to keep Lsel from being absorbed into the empire. To help her with this task, she’s given an implant containing her predecessor’s memories. The Teixcalaanli have non-gendered, non-ethnic names like Three Seagrass and Six Direction which makes for an interesting change of pace. I also liked that the author acknowledges that personality is mostly endocrine, not memory-based. Simply copying your memories into a computer won’t make you immortal since most of what makes you who you are will be lost. Although Mahit has studied Teixcalaanli culture, she’s still a fish out of water. She’s basically alone and far from home. When it turns out the previous ambassador may have been murdered, Mahit has to figure out who to trust while living in an alien culture. She needs to be politically savvy while also avoiding repeated assassination attempts. A fantastic start to a new space opera series. 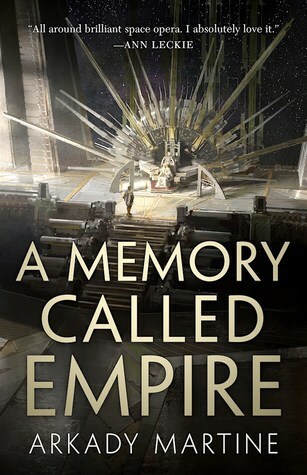 A Memory Called Empire will be available March 26 from Tor Books.